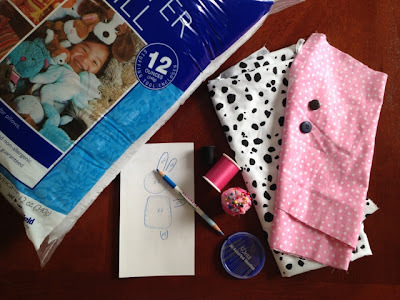 Miss Mel + Miss Heather: DIY: Stuffed Bunny! So as most of you know Miss Mel and I own a bunny, Sass. Well since I primarily live in Springfield and Miss Mel lives in St. Louis we have to split up our time with Sass. 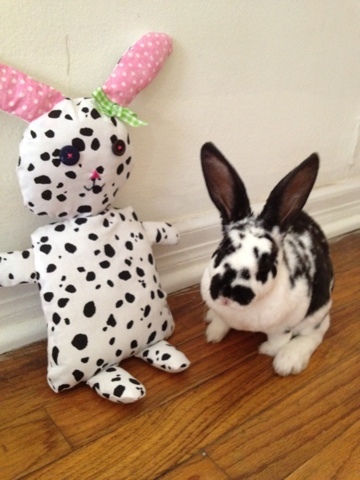 Basically I get her most of the time so I thought I would make a stuffed Sass for Miss Mel to have when she can't have the real bunny! I will say it's been awhile since I've used my sewing machine for things other than a quick clothing repair so don't judge my rudimentary sewing skills! I plan on many more projects to come this summer! This was my finished project but I'll walk you through the steps on how I made her! 1. Fold any fabric you will be using on body parts in half. This way you only have to draw the outline once, then when you cut you'll have the front and back with no fear of having different sizes. 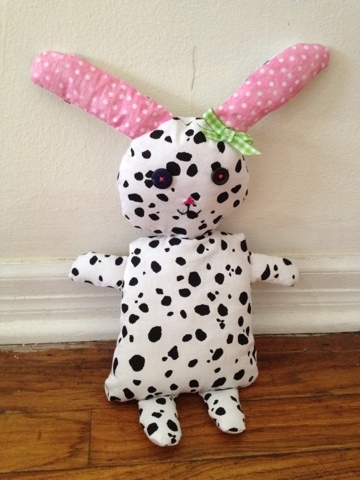 I used the black spotted fabric for the head, arms, legs, body and the back of the ears and the pink fabric for just front of the ears. I drew a small outline on paper of the things I needed to draw on fabric for a checklist. 2. 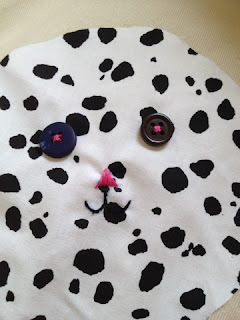 Once all fabric is cut out you will need to do the face before you do any major sewing. I drew a little triangle in the middle of the face then covered it up with pink sewing thread and a needle. I took black thread and sewed the smile on in a centimeter by centimeter fashion. 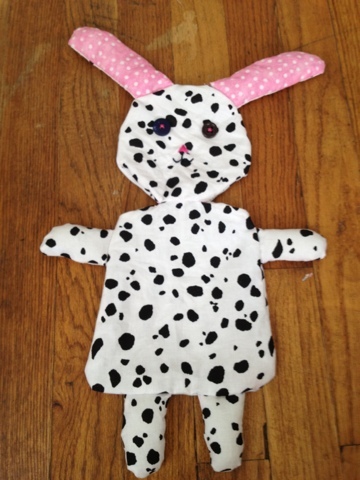 Next I put two dots where I thought the eyes should go and sewed them on in a criss cross manner. 3. You will need to pin all the fabric so that it once your done sewing along the borders the bunny will be inside out (Basically pin the front sides to each other). Make sure to sew the ears, legs and arms then stuff them before you work on the head and torso. 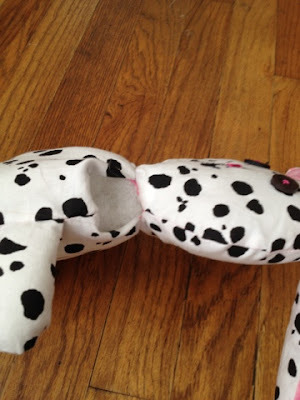 When pinning the head and torso together for sewing you will need to pin the ears, legs and arms pointing inward (in their respectful spots). 4. 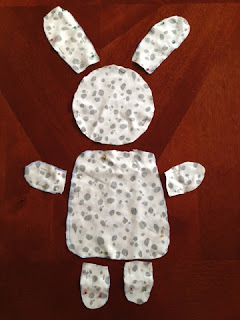 Make sure not to sew every border because you will need to turn the bunny inside out and then stuff her. When the bunny has been sufficiently been stuffed you will need to hand sew that hole shut with the raw edges fold inside. 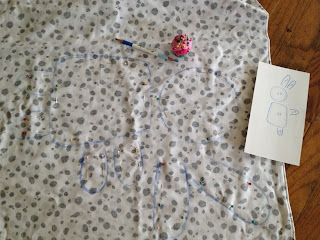 Be sure to use thread the same color as the fabric because it may be seen. 5.One last finishing touch was cutting a piece of ribbon and tying it in a bow. I sewed it on at the base of one of the ears and was done! Doesn't it look just like the wee Sass? This can easily be adapted for another type of animal such as shortening the ears and making it a bear or adding a tail and making it a tiger. This would make a great gift for a son or daughter or niece or nephew! Have fun sewing!